I was a bit sad to find out that the only Brocki (2nd hand shop) in our town was closing down. Not that it was great or special, but it was the only we had in Brugg whereas in Meilen we were spoilt for choice and quality of the items on offer. 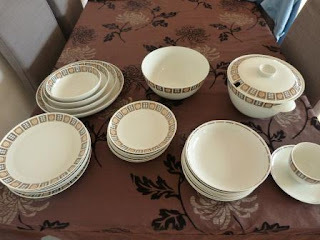 Anyhow, I popped in one last time during their closing down sale and snapped up an (incomplete) set of matching plates and serving dishes for a mere 20 CHF. It was made by the famous Swiss porcelain manufacter Langenthal and turned out to be a lot cheaper than buying an extra dining set in IKEA...Bargain!! I am itching to go Brocki shopping recently. Have yet to find out about those in my neighbouring towns... If there are any! Oh I love charity shops and I would be gutted if our local ones closed down.